For those that own the Acer Icronia Tab A700 or Asus Transformer Pad Infinity that have been patiently waiting for their Android tablet to be updated to the latest Android operating system, you just might like to learn that both of these Android slates are now receiving the Android Jelly Bean update. According to a report over on Unwired View, by way of Android Police and Brief Mobile, the Android Jelly Bean update should have arrived for the Asus Transformer Pad Infinity last week along with the update for the Asus Transformer Prime, however apparently a few last minute glitches stopped Asus from pushing out the Jelly Bean update for the Transformer Pad Infinity, but it is now rolling out to the slate over in the good old US of A. As for the Android Jelly Bean update for the Acer Iconia Tab A700, the OS update showed up over in Germany initially, but the update should be rolling out across the globe any time now. 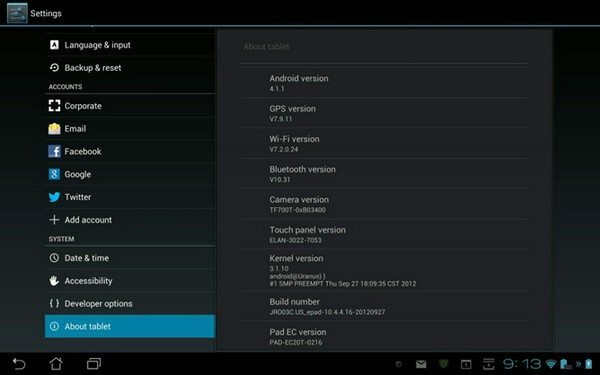 If you own a Transformer Pad Infinity or Iconia Tab A700 and haven’t yet received notification of the Jelly Bean update, you cam of course check for the update manually to make sure you are playing nice with Jelly Bean as soon as possible. The Android Jelly Bean update should bring bug fixes along with an overall improvement in user interface speed due to Project Butter; however if you do experience any strange issues after you have installed the Jelly Bean update on your Acer Iconia Tab A700, you can gain details on how to fix those problems by hitting up the XDA-Developers website. Have any of our readers updated their Transformer Pad Infinity or Iconia Tab A700 yet, and if so have you experienced and problems? You say “By way of Android Police and Brief Mobile” should be corrected to “By way or Brief Mobile” – Android Police has no original content from this leak. Please do not credit them for something they did not do.